Need an easy and quick weeknight dinner that won't break the bank? This recipe has got you covered on all fronts! In small stockpot, bring chicken stock to a boil over high heat. Add polenta, reduce heat, and simmer for 20 minutes, stirring frequently. Add half and half and butter and mix until melted. Remove from heat and set aside. In a large skillet, heat olive oil over medium-high heat. Add italian sausage and cook until browned, about 8 to 10 minutes. Reduce heat to medium. Add garlic, lemon zest, and lemon juice, and cook until fragrant, approximately 3 to 5 minutes. Stir in tomato paste, then add tomatoes. Cook until bursting, mashing with the end of a wooden spoon, approximately 10 minutes. Add spinach leaves and stir until wilted and evenly combined. Remove from heat and set aside. Salt if needed. In a small skillet, melt butter over medium heat. Crack eggs directly into pan and cook until whites are opaque, approximately 5 to 7 minutes. Sprinkle with red chili flakes. Divide polenta evenly among 2 bowls, then top with sausage mixture and egg. Finish with crumbled feta. St. Patty's Day is right around the corner and we are getting ready with these sinfully delicious adult milkshakes. You won't even miss the dairy in this Macadamia nut cream! Preheat oven to 400 F degrees. Toss carrots in olive oil and pinch of salt and pepper. Roast for 15 minutes. Meanwhile, blend remaining ingredients in food processor. Drizzle carrots with "cream" when complete. This amaretto cheesecake will turn skeptics into believers! Just in time for Valentine's day, here is one of our favorite dessert recipes yet. Combine all ingredients. Press onto the bottom of and ¾ inches up the sides of a 9 inch spring-form pan. Preheat oven to 450⁰F. Let cheese and eggs come to room temperature. Beat together cream cheese and sugar. Add eggs one at a time, beating after each addition. Blend in butter, almond extract, and Amaretto. Turn mixture into spring-form pan, and bake 20-25 min. Cool on a rack. Refrigerate at least 12 hours before serving. Remove sides of pan. To make whipped cream, whip ingredients on medium high speed for 5 minutes, then fold in almonds (reserving several for garnish). Place large dollop of whipped cream in center of cake and garnish with toasted almonds. Serve chilled. Fat Tuesday is around the corner and we are feeling indulgent. This savory bread pudding is truly amazing and can be served alongside a salad as a full meal! Toast bread cubes for 15 minutes. Whisk eggs, cream, and cheese together. Once toasted, soak bread cubes for 20-30 minutes. Melt butter over medium heat in large sauté pan and brown sausage, about 10 minutes; add salt and pepper. Add leeks and cook until softened, about 10 minutes. Add mushrooms and cook 5 minutes. Add wine and cook until evaporated, about 5 minutes. Add meat mixture to bread mixture in a 9x13 baking pan. Bake for 45 minutes. We love a good party--in honor of an upcoming baby, a football game (read: the Super Bowl), or Mardi Gras. Skewers are a must for these occasions and these are two of our favorite seasonal (yet simple) versions! Preheat oven to 375 F. Roast carrots for approximately 30 minutes until tender. Skewer with feta cubes and a small piece of mint. Using a melon baller, make approximately 4 dozen pear balls. Wrap pears in prosciutto and skewer. Meanwhile, heat the balsamic vinegar over medium high heat until boiling. Reduce heat and simmer approximately 30 minutes until it has the consistency of syrup. Drizzle over wrapped pears (or serve on the side). Inspiration for this dish comes from a dear friend and we are eternally grateful! Although there is no rice in this dish, we promise you won't miss it. In a wok, melt butter over high heat. Add chicken and sesame oil, and sauté until cooked, about 5 minutes. Add all remaining ingredients except cauliflower. Cook for approximately 5 minutes until fragrant and carrots are cooked through. Add cauliflower and cook for 2 more minutes until combined. Garnish with green onion, lime wedges, and Sriracha (if desired). In our opinion, any night is taco night. While we love all kinds of tacos, these shrimp tacos are easy and one of our favorites! Combine all ingredients in bowl (can be made up to an hour in advance). In skillet, heat butter over high heat. Add onions and cook until browned, about 8-10 minutes. Remove from skillet and set aside. Combine ingredients and let sit for 15 minutes. Using the same skillet in which the onions were cooked, heat butter over medium high heat. Add shrimp and cook until shrimp are pink and cooked through, about 3 minutes per side. 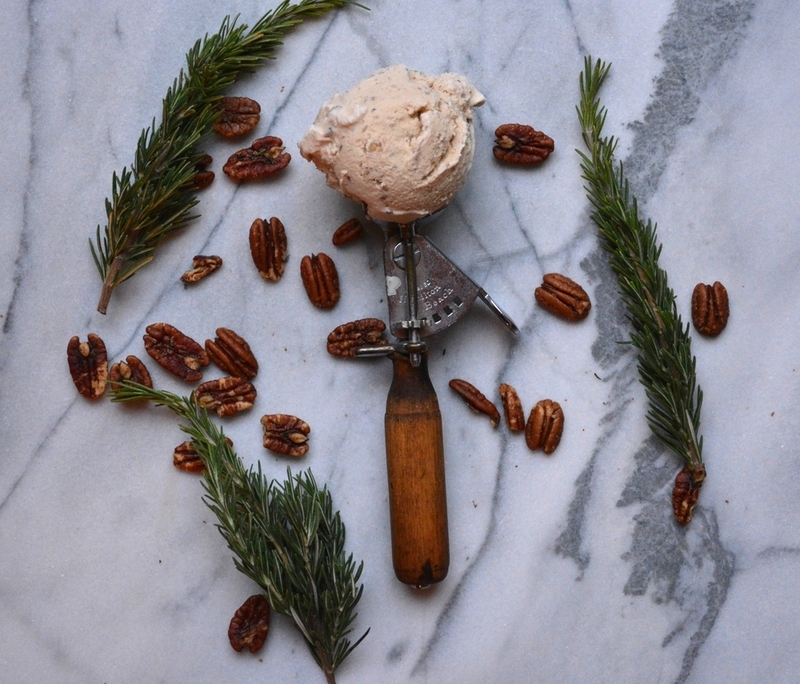 We cannot get enough of this ice cream during the Holiday season. Although we prefer the homemade variety, for a shortcut, just use store bought vanilla bean ice cream with crushed peppermint! Combine milk, sugar, vanilla, vanilla bean, and cream in a bowl, and mix with a hand mixer on medium speed until sugar is dissolved. Turn ice cream maker on and pour in mixture. Let mix until thickened, about 20 minutes. Add crushed peppermint and mix until combined. Transfer mixture to air right container and let chill unt desired consistency. Spice up your Thanksgiving turkey with this cranberry + orange + jalapeño chutney. Oh, and did we mention, there's also a hint of smokey bacon?? In small sauté pan, render bacon fat (cook over medium-low heat until bacon is golden, about 10 minutes). Remove bacon pieces and reserve for later use. Increase heat to medium-high and add onion and salt. Cook for approximately 5 minutes until softened and browning. Add vinegar and cook 1-2 minutes longer. Meanwhile, in a saucier pan, heat olive oil over medium heat. Add ginger and jalapeño, and sauté until fragrant, about 1 minute. Add cranberries and orange juice. Cook for approximately 10 minutes, stirring frequently and mashing as you stir. Add onions and sugar and continue cooking and mashing until desired consistency (typically about 5 minutes longer). The perfect al fresco lunch for a mild autumn (almost winter!) day. Gently combine all ingredients in bowl. Enjoy over a bed of arugula or on its own. Versatile, delicious, healthy, and indulgent--at the same time. Can't beat it! Try these cookies as a post-dinner snack or a morning pick me up. Feel free to add nuts, dried fruit, or your other favorite cookie add-ons. Preheat oven to 350 F. Combine ingredients using a potato masher. Bake for 15-20 minutes until golden. Let rest 5-10 minutes before serving. This will definitely be on our Thanksgiving menu. Enjoy! Combine milk, sugar, vanilla, and cream in a bowl, and mix with a hand mixer on medium speed until sugar is dissolved. Turn ice cream maker on and pour in mixture. Let mix until thickened, about 20 minutes. Add chopped pecans and mix until combined. Transfer mixture to air right container and let chill unt desired consistency. Although we typically do some prep for the week on Sunday, we also like to lounge around in a cozy blanket watching Netflix. That's why we keep it simple. This week, we asked our friend and dietitian, Blair Buras, to share her amazing rosemary buttered pecans recipe. Try these today and you won't regret it on Monday--trust us! Side note: these pecans also serve as a delicious base for other great recipes (coming later this week). Preheat oven to 250 F. Spread pecans on a large baking sheet. Toast in the oven for 30 minutes. Meanwhile, combine remainder of ingredients in small bowl. Once toasted, toss pecans in melted butter mixture. Return to oven and bake for 10 minutes longer. Thank you for sharing, Blair! Go follow @BlairBuras on Instagram for healthy recipes that don't compromise on flavor. Sick of standard tailgating fare?? These homemade wings are a sure fire(y) way to win over football fans and foodies, alike (yes, we know there is overlap!). A Fifth Season staple, we actually indulge in this tangy, garlicky starter year-round. Preheat oven to 425 F. Combine hot sauce, honey, garlic, tomato paste, and butter. Pour marinade over wings (reserving about 2 tablespoons to baste the wings at the end) and let marinate for 30 minutes. Arrange wings on baking sheet and bake for 30 minutes, flipping half way through. Once finished, brush with remaining wing sauce. Combine all dressing ingredients (smashing blue cheese crumbles if used). Serve on the side. We are huge fans of meatless Monday. Not only does it give us the opportunity to eat more plants, it forces us to be creative with our food! This Monday, we tried a veggie burger using pumpkin as the base. We served ours Banh Mi style, but it would also be great on top of a Southwestern salad (think: iceberg lettuce, pico de gallo, cotija cheese, etc.). Combine all ingredients and let jalapenos steep until desired spiciness (each pepper is different!). Halve the pumpkin and remove seeds (reserving for roasted pumpkin seeds). Cut pumpkin into large chunks (about 2 inches) and boil in 2 quarts of salted water for approximately 25 minutes. Meanwhile, cook quinoa according to package instructions (we like to substitute chicken stock for water). Once pumpkin is done cooking, remove from water and, using a spoon, scrape the pumpkin "meat" from the shell (it should come right off!). Dump out the water and place pumpkin meat back into the pot over lowest heat possible (the heat will allow some of the excess water to evaporate). Add remainder of the ingredients and combine. To cook the patties, heat 2 tablespoons of olive oil in a skillet over medium heat. Working in four batches, cook two patties at a time (patties should be about 1/3 cup each), for five minutes per side until brown and crisp. Tip: you will need to add more olive oil for each batch. To serve, slice bread in half and place patty inside. Top with radishes, cilantro, and carrots, then finish with the nuoc cham. We love a margarita in its purest form (tequila, lime, orange, Topo Chico, end of story), but the addition of sweet persimmon is a no-brainer. Top these orange cocktails off with a festive stirrer and you've got yourself Halloween party perfection! Mix all ingredients (except Topo Chico) in a cocktail shaker. Pour over glasses which are filled to the brim with ice, and top off with Topo Chico (we usually do about 75% margarita mixture and 25% Topo Chico). Sometimes, all you really need in life is a plate of homemade pasta. Linguine alla carbonara holds a special place in our hearts as it originated in Rome, one of our favorite cities on the planet (and did we mention, it's delicious??). Cook linguine in large pot of salted boiling water. In a skillet, brown pancetta over medium-high heat, then remove with slotted spoon to paper towel to drain. In same skillet, sauté onion for 3-5 minutes on medium-high heat, then add garlic and cook for 1 minute longer. Add pancetta back to the skillet, along with wine and broth. Meanwhile, whisk eggs, parmesan, and parsley in a bowl. As soon as the linguine is cooked, toss into the bowl with egg mixture until fully coated. Then, combine pasta with pancetta mixture, adding salt and fresh cracked pepper to taste. Garnish with parsley and parmesan. Although we are familiar with the ubiquitous labeling of pumpkin as passé, we can't help ourselves! The tiny pumpkin seed packs a punch, both in flavor and health benefits. Replete with zinc, Omega-3 fatty acids, and more, these roasted seeds are perfect for a midday snack or as a nutrient-rich addition to salads. Additionally, this sweet and spicy seasoning mixture is anything but basic. Introducing our signature "Five Seasoning"--use it on everything from pumpkin seeds to baby back ribs. Preheat oven to 350 F. Toss pumpkin seeds in butter and Five Seasoning and arrange on baking sheet. Cook for 15 minutes. Enjoy immediately or refrigerate for up to a week. Decorative gourds are everywhere--mantles, centerpieces, front porches, and now, dinner plates. This stuffed acorn squash is as beautiful as it is flavorful. We like to use the carnival variety because of its mellow flavor and bold stripes. Packed with healthy grains, protein, and a vegetable high in dietary fiber and other nutrients, this dish is so well-rounded that the only side you'll need is a glass of your favorite wine. Preheat oven to 425 degrees. Sprinkle salt, pepper, garlic powder, sugar, and olive oil on cut side of squash. Place cut side down on baking sheet and roast for 25 minutes. Once complete, reduce heat of oven to 375 degrees. Meanwhile, cook quinoa per box instructions. Over medium heat, saute ground meat with all ingredients, except walnuts and quinoa. Cook until ground meat is browned and water is dissolved, about 10-15 minutes. Add quinoa and walnuts to mixture and stir to combine. Evenly distribute mixture into each of the four squash "bowls". Sprinkle with Parmesan cheese and bake in oven for 10 minutes. Garnish with green onions and serve.